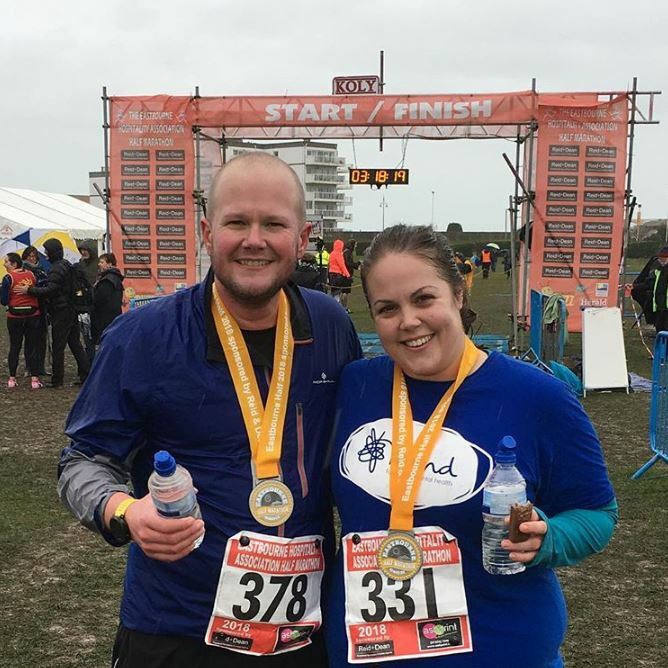 On Sunday 4 March LGB’s repiano cornet player Emma Ruffle took on the Eastbourne Half Marathon in support of mental health charity Mind. The band were well represented at the event, with flugel/bass player Alex Emberley appearing at the start on behalf of the RNLI, and former member Tom Elliott joining Emma on the course to provide moral support and assist with the consumption of (green and yellow) jelly babies. The weather on the sunshine coast didn’t exactly play ball, and by the end of the fourth mile the rain had really set in. After a seemingly endless slog along the seafront (accompanied by some young brass players, a drum group, and – for some inexplicable reason – a bagpiper) the few miles around Sovereign Harbour were a real challenge that not even copious amounts of jelly babies and a lengthy game of ‘what’s your favourite’ could combat. By the time the route returned to the seafront at the 11 mile point, manual dexterity in the fingers was a thing of the past and there was a definite whiff of hypothermia in the air. With 200 yards to go, by now soaked through, and with blisters on top of blisters, Emma found the sprint finish she’d been saving herself for and crossed the line in just over three hours, to be rewarded with the traditional finisher’s medal and banana. There’s still time to donate some much deserved sponsorship to Mind on Emma’s behalf – and all at LGB wish her many congratulations. When’s the next one, Em? !